The car bomb that went off in Baghdad’s Sadr City area killed at least 36 people and wounded dozens, AP reported, citing police sources. The Islamic State terrorist group has claimed responsibility for the attack, according to the terrorists’ news agency, Amaq, as quoted by Reuters. The attack targeted Shiite Muslims, it claimed. The explosive device went off at a crowded fruit and vegetable market located in Sadr city, a predominantly Shiite area. 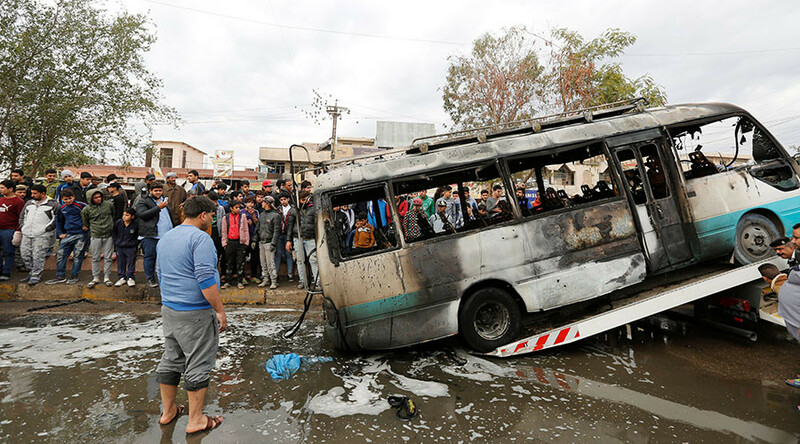 According to the Iraqi Prime Minister, Haider Abadi, the bomber pretended to hire workers and detonated the explosive device after people gathered around him, AP reports. “A big boom came, sending them [people around the attacker] up into the air,” Asaad Hashim who witnessed the explosion told AP. Before the blast, workers were pushing and shoving around the vehicle of the alleged IS bomber, the witness said. Following the explosion, Shiite militias were seen transporting the bodies of the dead and injured from the scene, AP says. IS (formerly ISIS/ISIL) often targets places frequented by civilians in Iraq. Twenty-nine people were killed in three Baghdad bombings just on Saturday. The string of attacks comes just days after Iraqi Prime Minister Haider Abadi said that it would take the Iraqi army some three months to drive IS from the country with the backing of the US-led coalition. Iraqi forces have been conducting an operation to retake Mosul, the Iraq’s second largest city, from IS since October. It has been reported that some 1.5 million civilians may still be trapped in the city, unable to flee.